These days, Tudor is a brand that needs no introduction, but that wasn't always the case. There was a time not so long ago, here in the States, when Tudor was little more than a memory, and if recalled, thought of as "Rolex-lite", with little regard or acknowledgement of its own storied history. But that was then and this is now. Ever since the release of the divine Heritage Chrono at Baselworld 2010, collectors and watch brands alike have been on notice that Tudor is no longer content to live in its big brother's shadow. With their triumphant return to the United States market in 2013, it was clear to all the Tudor was now its own brand. Over the course of these past six years, Tudor has impressed and stunned in equal measure with the Black Bay Heritage, the Pelagos, the North Flag, and even found time to create their own in-house movement, yet still keep a lid on pricing. Witchcraft and dark sorcery, if you ask me, but that shouldn't stop anyone from putting one of these watches on their wrist and calling it a day. So, where is Tudor now? 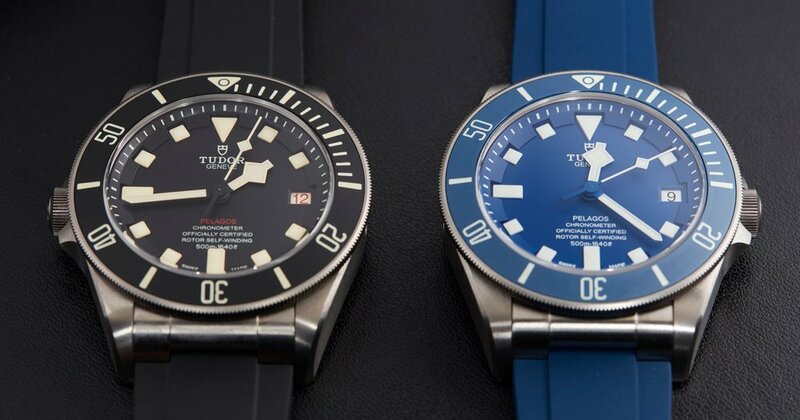 Their latest release is a variation on the Pelagos, cheekily called the Pelagos LHD in a nod to both its lefty crown and brand's English heritage, and it incorporates several details from the Tudor's past, that were no doubt intentionally done as dog whistles for rabid collectors such as ourselves. From the pointed crown guards – which have been a design detail from the start – to the "Roulette" date wheel, red Pelagos text and, finally, the military-inspired "destro" left-hand case layout, it's a piece by collectors and for collectors, and yes, the collectors have come running. Which brings us to Monday night... To help celebrate the success of the limited production Pelagos LHD, and, indeed, their entire Pelagos and Heritage Black Bay collection, Tudor and RedBar gathered at the storied mid-town watering hole and restaurant, Bill's Townhouse, for an evening of sparkling conversation, amazing food and some truly great timepieces. Pelagos LHD - I'm not kidding, this thing is awesome. Period. Yes, I know that there are those out there that decry the use of "fauxtina" on principle, but I'm here to tell you that in this instance you're flat-out wrong. Without the warmth of Tudor's beige lume formulation, the entire house of cards would collapse. Picking Russell's brain - Yes, he clams up the second that words like "Basel" pop up, but the man is a collector at heart and his insights into the industry are welcome indeed. My steak - No, really, it was awesome. It goes without saying that we had an absolute blast. True, while our attempts to get Russel and Silvan inebriated enough to spill the beans about the upcoming Basel releases failed (Rolex has trained them well), the conversation and the wine flowed in equal measure. Indeed, no one went home empty handed; literally, thanks to the gift bags, and figuratively thanks to the good times. Three Black Bay Darks (aka the Black Bay "Kathleen") provide enough lume to read by. Yes, the LHD also glows like Chernobyl. Vintage hotness, courtesy of RedBar members. It wouldn't be RedBar without a proper sexpile, now would it? No, it would not. So, what's next for Tudor? As noted above, our attempts to divine the answers were politely rebuffed, but with Baselworld just around the corner, we'll find out soon enough. Given their track record of late, it's hard to imagine that they'll do anything other than bring the heat in 2017.